C-GOZQ at Calgary, Austin Airways colours. • 55-3260 United States Army on 5th April 1956. Designated U-1A. Delivered from Downsview to the Transportation School at Fort Eustis, VA. Note: By Jan-1962 defined as an aircraft used for ground instructional technical training and later by Sep-1968 as permanently grounded but with systems functioning until Jan-1973. Jan-1973. Put up for disposal as military surplus. Entries preceded by dates are extracts from Canadian Department of Transport archives. (Very little paper in this file. Apparently imported with no log books, by road, I assume). 23-Jun-1975 Temporary Certificate of Registration and Flight Permit for Certificate of Airworthiness test flight by White River Air Services at Western Aircraft Co., Oshawa, ON. • C-GOZQ White River Air Services Ltd., Timmins, ON. Provisional registration, 23-Jun-1975. 29-Jul-1975 application for Certificate of Registration by White River Air Services Ltd; unknown Certificate of Airworthiness issued. 15-Sep-1975 Certificate of Registration issued to White River Air Services Ltd., White River, ON. • C-GOZQ to White River Air Services Ltd., Timmins, ON. Regd 15-Sep-1975. Note: The aircraft was not in a flyable condition and so was trucked from Fort Eustis to the Weston Aircraft Company at Oshawa, ON where it was rebuilt. At this stage the aircraft's historical records were not available from the Army. Accident: Chapleau, ON. 27-Sep-1975 the Otter crashed at Chapleau, ON. The float equipped aircraft took off from Chapleau headed for South Porcupine. The pilot lost control on take-off and crashed into trees, causing serious damage to the left wing, floats, propeller and cowling. Rebuilt by Field Aviation, Calgary, AB.,, during 1976 & 1977. • C-GOZQ Austin Airways, Timmins, ON. Aug-1977. (Owned by same Company that owned White River A/S). Accident: Tukanee Lake (White Lake) ON 48.39N/85.14W Tukanee Lake, ON. 17-May-1978. The aircraft was taking off from Tukanee Lake, Ontario en route to Kabinakagami Lake. It was a warm afternoon with a temperature of 25C and the Otter was loaded to maximum gross, with a pilot, two passengers and cargo. Following a lengthy glass water take-off run, the aircraft became airborne near trees and rising ground at the end of the lake. The pilot reduced to climb power and the aircraft began to sink. It came down in a swamp at a shallow angle and skidded sideways, tearing off the floats. One of the passengers received minor injuries, as she had not fastened her seat belt. J.W.L.Kruyk and two passengers uninjured. The Otter was completely wrecked. Note: According to Ian MacDonald, our researcher. Tukanee Lake isn’t in the official gazetteer, it is a local name. Note: In July 1978 the wreck was sold by the insurers to Hull Air Service Ltd. At that stage the wreckage was still at the crash site. It was subsequently retrieved by Austin Airways personnel and brought back to Timmins. In January 1981 the wrecked fuselage and other parts of the Otter were trucked to Calgary where they were broken up for spare parts. • C-GOZQ. Canadian Civil Aircraft Register shows as White River Air Services Ltd., Timmins, ON. Canx 16-Jan-1985 as permanently removed from use and removed from register. Otter 104 was delivered to the United States Army on 5th April 1956 with serial 55-3260 (tail number 53260). It was delivered from Downsview to the Transportation School at Fort Eustis, Virginia. It was to spend its entire military career at Fort Eustis. By January 1962 it was designated a “Category A Maintenance Trainer” (defined as an aircraft used for ground instructional technical training). In September 1968 it was designated a “Category B Maintenance Trainer “ (defined as an aircraft permanently grounded but with systems functioning). It continued under this designation until January 1973 when it was put up for disposal as military surplus. The Otter was still located at Fort Eustis when it was sold on 9th July 1974 by the Defense Property Disposal Office for $19,422 to White River Air Services Ltd., of Timmins, Ontario. The aircraft was not in a flyable condition and so was trucked from Fort Eustis to the Weston Aircraft Company at Oshawa, Ontario where it was rebuilt. Even at that stage the aircraft's historical records were not available from the Army. 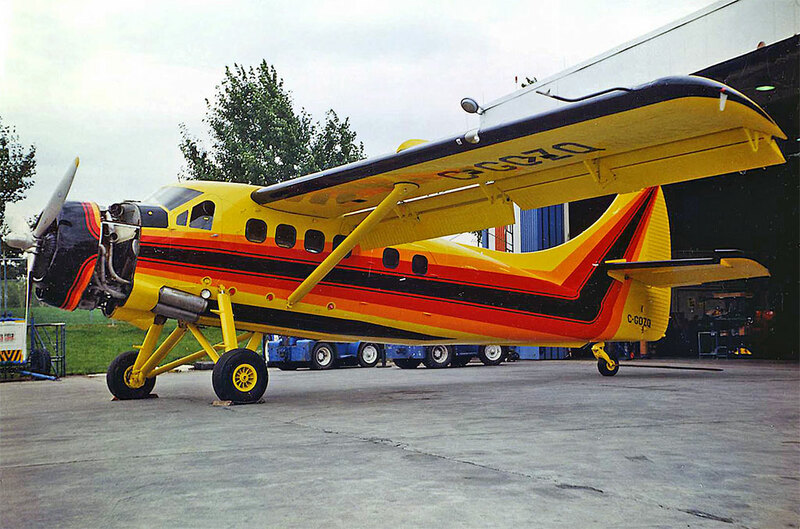 On 23rd June 1975 marks C-GOZQ were provisionally allocated to the Otter for White River Air Services. By September 1975 the rebuild had been completed and the aircraft was at Hamilton's Mount Hope Airport, ready for delivery. It was formally registered on 15th September 1975 and entered service with White River Air Services. Unfortunately its initial period of service was to be very brief, as twelve days later, on 27th September '75 the Otter crashed at Chapleau, Ontario. C-GOZQ was taking off, on floats, from Chapleau that day headed for South Porcupine. The pilot lost control on take-off and crashed into trees, causing serious damage to the left wing, floats, propeller and cowling. The Otter was taken by road to Field Aviation, Calgary for repair. It was repaired during 1976 and 1977 and repainted into the spectacular yellow, black, red, orange scheme of Austin Airways, a company under the same ownership as White River Air Services. The rebuild took quite a time to complete and it was not until 30th August 1977 that a ferry permit was issued from Calgary back to Timmins, where the Otter entered service with Austin Airways. C-GOZQ crashed again on 17th May 1978. It was taking off from Tukanee Lake, Ontario en route to Kabinakagami Lake. It was a warm afternoon with a temperature of 25C and the Otter was loaded to maximum gross, with a pilot, two passengers and cargo. Following a lengthy glass water take-off run, the aircraft became airborne near trees and rising ground at the end of the lake. The pilot reduced to climb power and the aircraft began to sink. It came down in a swamp at a shallow angle and skidded sideways, tearing off the floats. One of the passengers received minor injuries, as she had not fastened her seat belt. The Otter was completely wrecked. In July 1978 the wreck was sold by the insurers to Hull Air Service Ltd. At that stage the wreckage was still at the crash site. It was subsequently retrieved by Austin Airways personnel and brought back to Timmins. In January 1981 the wrecked fuselage and other parts of the Otter were trucked to Calgary where they were broken up for spare parts. The registration was formally cancelled on 16th January 1985.